Ground floor: Spacious kitchen/dining room (oven, microwave, dishwasher, washing machine, TV). Sitting room (wood burning stove, TV, DVD) with door to covered terrace. Cloakroom. Double bedroom with en suite shower room. Double bedroom with en suite bathroom and door to garden. Twin bedroom with en suite shower room and door to garden. WiFi. Air conditioning throughout the house. Outside: Terraced grounds of lawns and patios. Garden house incorporating dining area (A/C). Barbecue. Table tennis. Private swimming pool (7 x 4m) with Roman steps. Adjacent pool (6m x 2m, uniform depth of 60cm). Traditional architecture and the most up-to-date of contemporary interior designs are beautifully interwoven throughout this stylishly restored country home which sits amidst picturesque countryside just a 10 minute drive from historic Ponte de Lima. Sister property of Casa da Cuca and the recently completed creation of one of our most long-standing owners, Casa da Cuquinha is the result of many years of detailed planning and carefully executed design. Originally a traditional family home and discretely attached to Casa da Cuca, it has been creatively transformed into an elegant retreat where contemporary décor and the most fashionable of appliances sit within original stone walls which with their traditional charm and eye-catching stone pillars preserve the building’s heritage with charming effect. The three bedrooms have been designed to replicate the calm ambience of a smart hotel, their sleek furnishings, en suite facilities and muted colour schemes exuding style, elegance and a welcoming sense of comfort. In the spacious living areas, equally fashionable pieces are set off against a charming backdrop of open stone walls, exquisitely restored original features and polished wood ceilings, all of which call to mind the origins of this much loved home. Step out from here onto the covered stone terrace that spans the property’s main façade and you will find yourself looking across lawned terraces and cobbled patios to the centrepiece of the beautifully tended garden: an attractive swimming pool bordered with slate tiles and an elegant waterfall feature which cascades down into a separate, smaller pool below. 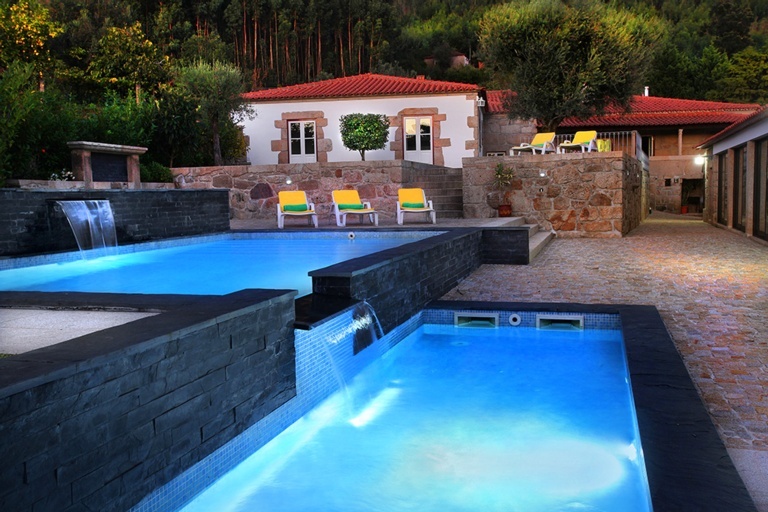 To the side, a wonderfully spacious garden house provides the perfect setting for meals by the pool although those wishing to sample local cuisine will not have far to go since the attractive riverside town of Ponte de Lima is home to some excellent restaurants. This is just 5km from the house, whilst the sandy beaches of the Costa Verde are a 30 minute drive away. Closer to hand, a local shop selling basic items can be reached on foot via cobbled lanes from the house. Terraced gardens mean that very young children may need supervision. Take the funicular to the church of Santa Luzia, climb the dome and look out from the very top. Then head into town and wander around the embroidery shops for which the town is famous. Hire surfboards and hit the waves! The beach at Afife is a much sought after spot for keen surffers. Hire boards at the surf school, take a lesson or just sit back and watch the surfers in action. Esposende and Moledo are two of our favourites and have plenty of amenities for you to spend the whole day there. Just the other side of the Douro river from Porto, there are numerous lodges including Taylors, Sandeman's and Grahams and most of them offer tastings and tours. With stunning dune backed beaches and shops to peruse, Esposende is well worth a visit, if only to sit back and relax in one of their beach bars. Follow these narrow streets as they that tumble down from the cathedral to the quayside of the River Douro. Take a while to absorb the sights and sounds of this unique city. Visit the caves where port is left to age to sample for yourself this world famous drink. You could also visit the Planetarium to plot some of those stars you have been watching. Stop off in the bodegas which produce the light sparkling and very tasty wine of the region. Take a guided tour and enjoy a sample! Drive for miles through the largly undiscovered beautiful mountain scenery of this stunning area of natural beauty. Try one of the hiking trails in the park and stop off for a picnic lunch at one of the many shady spots dotted around. There is an abundance of wildlife to be spotted and beautiful scenery to enjoy. The course is open to visitors and the Axis hotel has a lovely restaurant which is open to the public. This is a beautiful town, with fine buildings and pretty cobbled squares. Visit on a Monday morning and you may be fortunate enough to witness the local market, which is held on the sandy river beach every other week. Enjoy watching the locals go about their day to day lives on your way by and see what delights you discover exploring the winding streets and tree lined paths. Spend all day relaxing with a book, take dip to cool off in your private pool then enjoy a candlelit dinner with a cold glass of wine on the terrace. The country's first administrative seat was established here by Portugal's first King, Alfonso I. Explore the streets of the town and see the historic buildings. Not for those on a diet! A sandwich loaded with steak, sausage and other meats, covered with melted cheese and a fried egg and served in a spicy tomato sauce. Fast becoming one of Europe's top cultrual events. Performances take place in several venues including manor houses, local churches and the Teatro Diogo Bernades, a 19th century theatre in Ponte de Lima. Join the locals in the little bars dotted around Ponte de Lima's cobbled streets. Sample the local wine, try a homemade cocktail, or sip a gin and tonic on the terrace. The bridge looks beautiful at night when it is lit up and it is a perfect way to walk off that tasty meal you've just had. This path which runs alongside the river is specifially for the use of cyclists and pedestrians and being so close to the water there is plenty to see. Pack a picnic and stop off in a shady spot along the way while you watch the boats go by. The welcoming owners would be delighted to prepare a traditional meal for you for any occasion, a great way to sample the local food.